This story in the WSJ highlights how much fast money has moved into silver. The most popular trading vehicle for the general market is the SPDR S&P 500 (SPY) ETF. On Monday, volume in the silver ETF actually surpassed SPY! And Tuesday was quite close as well. Amazing for an ETF that is relatively new to the market, but this is fever pitch action at its best. That was essentially the top (within a day or two). Now we are seeing similar action in gold - it is still far off (relatively) from inflation adjusted all time highs around $2400, but a nice big round number of $2000 approaches. Sometimes those create psychological impacts. 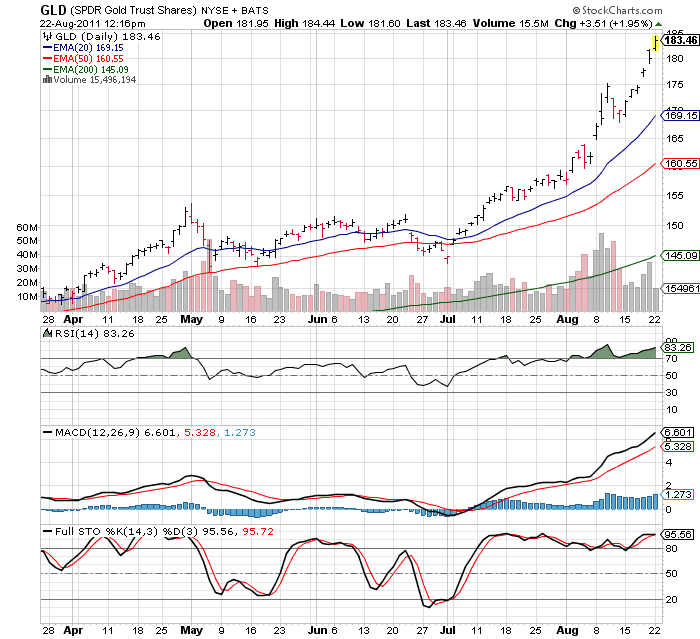 Also we have a Bloomberg story indicating the market cap of the SPDR Gold ETF (GLD) now approaches that of SPY. Based on today's action (another 2%+ rally in gold, and flattish action in SPY) they might cross. I don't find that indicator as significant as the one in silver from April (as the silver indicator was about volume and intensity of buying), but it is something to note as the yellow metal goes parabolic. Even as a gold bull (not as inflation hedge, but as reckless central banker hedge), I would begin to get quite cautious here and be watching like a hawk for one of those ugly reversals. Every secondary indicator is massively overbought. Thus far I've only seen one margin requirement hike - I think silver was hit with 4-5 in short order if memory serves. Gold is approaching a new milestone in its role as an investment and haven, with the leading exchange-traded fund that tracks bullion closing in on its equities counterpart as the biggest ETF by market value. SPDR Gold Trust’s market capitalization rose to $76.7 billion on Aug. 19, according to the most recent data compiled by Bloomberg, as the metal topped $1,881 an ounce for the first time. SPDR S&P 500 ETF Trust (SPY), which has been the industry’s largest exchange-traded fund since 1993, stood at $78 billion, a 1.7 percent advantage. At the start of the year, the Standard & Poor’s 500 Index-tracking ETF was 56 percent larger. The metal is up more than 32 percent in 2011, which would be its 11th straight year of gains, while the S&P 500 Index (SPX), a benchmark of the biggest U.S. stocks, has lost 9.5 percent including dividends. “The dramatic surge in demand for gold reflects the aggregation of many investor preferences -- for example, from those seeking shelter from lower stock markets to those protecting against currency debasement by central banks,” El- Erian wrote in an e-mailed response to questions. The SPDR Gold Trust ETF, created by the World Gold Council in November 2004, is the biggest ETF tracking the price of the precious metal. State Street, based in Boston, is the sales and marketing agent for the fund, which is physically backed by gold bars deposited in a London vault. The growth in SPDR Gold Trust this year has been largely driven by the rising value of gold, as the number of shares outstanding in the fund increased by about 1 percent. 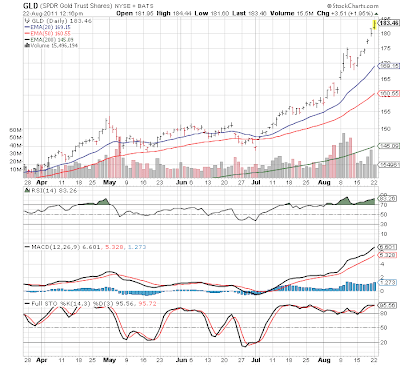 Since July 1, the number of shares in Gold Trust has climbed by 7.1 percent, contributing to the gain in assets. SPDR Gold Trust has climbed every year since inception, including a 30 percent gain in 2011. The gold ETF has more than doubled in price since the collapse of Lehman Brothers Holdings Inc. in September 2008 roiled financial markets, while the SPDR S&P 500 ETF has fallen 4.7 percent including dividends.